The Arrowsmith Lake catchment area is five square kilometres, or 1.5 percent of the 324 square kilometre Englishman River catchment area. Construction of the Arrowsmith Dam raised the level of Arrowsmith Lake by 12 metres and increased storage capacity behind the dam to 9 million cubic metres. 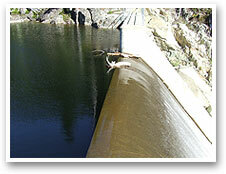 The Arrowsmith Dam reservoir fills up each spring until it naturally overflows the dam to the Englishman River. The Provisional Operation Rule applies until the new intake is in operation. The permit states when the flow in the river drops below 1.6 cubic metres per second, as measured at the Englishman River hydrometric gauge in Parksville, the AWS releases water to maintain the flow at 1.6 cubic metres per second. This is outlined in the Conditional Water Licence that governs the release of water from the reservoir. Depending on climatic conditions and seasonal requirements, conditions of the licence are adjusted in consultation with federal and provincial fishery authorities. At certain periods, the flow requirements may be reduced to ensure sufficient water can be retained in the reservoir for release during September and October. Occasional adjustments in the Operation Rule are required when drought summer conditions exceed the 15 year drought design parameter of the Arrowsmith Reservoir. 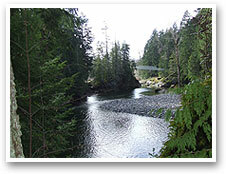 The AWS water licence allows for 47,888 cubic meters per day to be diverted from the lower Englishman River. This amount is fully supported by storage capacity. The AWS could not have obtained its licence from the province without being able to provide this level of storage.